When I was five, I entered a local fishing competition. We don’t talk about it very much in my family, seeing as that day has hung over my relations with the menfolk like the stench of a fish that has shimmied its way out of the bucket and hidden under the truck seat for a week. 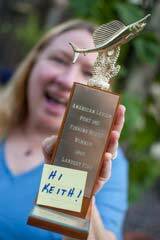 Thing is, I didn’t maliciously set out to win the trophy, which was quite a lot larger and heavier than the fish I caught to win it. Yet somewhere deep down, I think my brother Joe and my cousin Keith have never gotten over the fact that I bested them at fishing, even if it happened quite by accident. 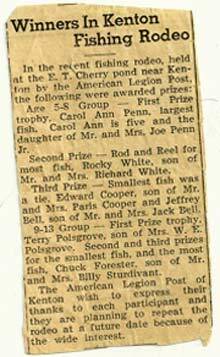 Having read about the upcoming American Legion fishing rodeo in the Union City Daily Messenger, those two were primed for angling glory. They’d memorized the announcement in its entirety, and they recited it to each other as they raced their bikes up and down our gravel road. It was all they’d talked about for the entire week. Winners would receive real, honest-to-God trophies, a rarity in those pre–Little League days in rural Tennessee. As the boys trooped out the back door to the pickup truck that Saturday morning, my daddy glanced back, saw me standing barefoot in my pajamas with cereal stuck to my face, and figured there was no harm in taking the little one along. And that’s precisely what happened. As for the type of fish I caught, I know it had scales and no whiskers, so it wasn’t a catfish, which is what folks usually caught around there. It’s likely that it was small enough to be released back into the pond after being weighed and measured, and I’m pretty sure that’s what happened, because the only fish I carried home that day was the beauty mounted atop a magnificent wooden trophy, a golden metal swordfish perched on coral, just like I’d seen in National Geographic. I also remember that Joe and Keith didn’t utter a word to me for the duration of Keith’s visit that summer. They spent entire days out and about on the farm, avoiding me as if my victory cooties would somehow mutate and spawn something they were in danger of succumbing to and for which there was no cure. In spite of the flashy spoils of my victory, I found myself more nibbled on than bitten by the fishing bug. Each summer that followed, I’d make exactly one fishing expedition, which would satisfy my urge until the next year. I’d take a Folgers can and a spoon and dig for night crawlers in the shadows on the north side of the barn, where the soil was dark and damp and the worms fat and reluctant. With my coffee can of worms clutched to my chest and a homemade cane pole thrown over my shoulder, I’d set out walking down our dusty gravel road for the pond and spend the next few hours perched on its grassy bank, pulling out of it whatever took a fancy to the worm on my hook. I made these trips alone. The guys were old enough to help out on the farm by this point, having graduated from bicycles to tractors, and had decided that driving a John Deere was much cooler than sitting on the pond bank holding a pole for hours on end waiting for some muddy fish to nibble. That was fine with me, because by then I’d decided that boys had more germs than fish and night crawlers combined. After each trip, I’d haul back a load of tiny fish whose sole purpose had been to replenish the pond after my previous fishing spell had depleted its stock. By the time I got home with my bucketful of fry, it was too late to return them to the pond. One summer afternoon my parents counted 70 wee goners. I thought catching and bringing home so many fish was a feat worthy of high praise. But the fish I caught never made it to our supper table, the grown-ups always pronouncing them too small to bother cooking. This was puzzling to me, for a fish was a fish. Size and type didn’t matter to me. Catching it and carrying it home did. And so I came to believe in my child’s mind that children caught children fish, while adults caught adult fish, fish of import and gravity. Fish to be reckoned with. Fish to be eaten. Despite my disenchantment at the dinner table, I still had an ace in the hole whenever one of the guys saw fit to tease me about my diminutive catch. I’d just reach for my trophy and waggle it at one or both of them, and they’d wince and make themselves scarce. Still, there remained a disconnect for me between the catching and the eating. It wasn’t until decades later that I finally ate a fish that I had caught. It was after a dozen of my girlfriends and I had piled onto a fishing boat headed for the deep waters off the coast of Southern California. While not exactly a Hemingway-style affair, it still gave me the chance to fish like a big girl. As I loaded the hooks of my borrowed rod and reel with pieces of squid and dropped the line into the Pacific, a cluster of cocky pelicans bobbed in the water, and hopeful seagulls circled the boat, watching my every move. I wasn’t initially inclined to share my catch, but once I got into the groove and recalled the adage that there are plenty of fish in the sea, I loosened up. All totaled, I caught more fish that day than I had in my entire life. Even the smallest of my catch of assorted rockfish was much more impressive than anything I’d ever pulled from our tiny pond back home. I don’t see what the big deal is. Keith’s Facebook page is loaded with photos of him posing on his boat in the Caribbean, holding aloft countless gargantuan fish he’s caught and, no doubt, grilled for friends. I’d never known that pleasure. In my mind, we were even. I guess this one still stings in the way that only childhood defeats can—although I can’t say for certain, seeing as I happen to own a trophy topped with a swordfish. 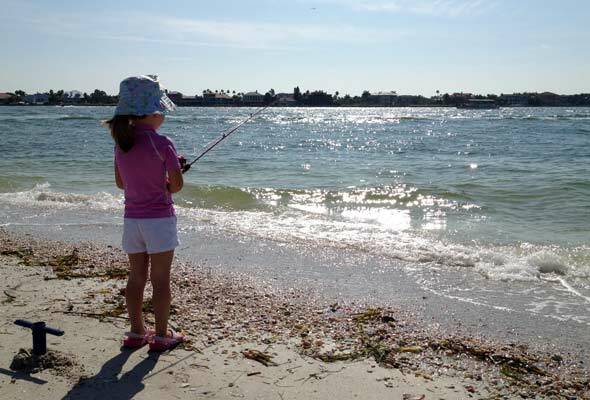 What I do know is that my deep-sea fishing adventure was a world away from the muddy-pond days of my youth, when I couldn’t imagine fishing in a body of water whose edges I couldn’t see any more than I could fathom anyone actually wanting to eat the catch. If there was a prize for me this time, it was catching an adult fish at last. I felt like such a grown-up. Photo © 2013 The Suburban Mom. All rights reserved. All recipes and photos used with permission of the publisher.